The interest rates will rise as a consequence of Quantitative Easing and the explosive debt situation. Although we cannot compare the actual situation with the 1920-30’s (in those days the creation of money and credit was limited by Gold), I am convinced we shall see a similar evolution of the Bond markets. See how FAST Bonds drop once the down wave has been initiated (example Greece). January 14, 2010 - This is how it is NOW in the USA - see how similar with the Great Depression!!! We have GLOBAL MARKETS. The situation as described for the US is similar for the EU. Authorities can manipulate interest rates in the short run and try to delay a rise in interest rates only for so long. But this is the only action which is possible. The world financial markets finally decide and dictate Interest rates. What we are about to see is that Long term interest rates will push up short term rates. The resistance level is 4,60% and it is in the process to being broken. Notice the significance of the 4.0% level. A huge reversal pattern is underway. The critical right side resistance level has been 3.9%, well defended. The left side critical resistance level has been 4.0% and 4.1% from late 2008. The trend is up, accentuated by the stochastic index since October. Watch a breakout above the important 4.0% level. · Huge borrowing requirements: US treasury borrowed over $1 trillion in the year to September 2008; it is expected to borrow close to $2 trillion in the year to September 2009. That’s 13% of US Gross Domestic Product. Not all of this is deficit; about $500 billion is refinancing and another $500 billion is for bailout schemes, some of which the US taxpayer may eventually see back. 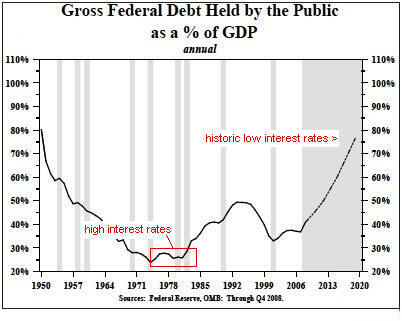 Still, in terms of GDP that’s far more debt than the US capital market has ever been asked to absorb, other than during World War II. At some point, “crowding out” must occur; we certainly cannot assume that Asian central banks will want to take the entire load, at interest rates less than zero in real terms. · (Hyper) Inflation. The Fed appears to believe that the current recession will bail the United States out of its inflation problem. The example is given of Japan in the late 1990s, after which the Fed explains that they will avoid the mistakes of the Bank of Japan, thus preventing damaging deflation. Actually that seems to be wrong on two counts. The main mistake in 1990s Japan was not monetary but fiscal; government spending was allowed to expand inexorably, producing ever larger and larger deficits. That mistake appears to be only too likely to be repeated here. The difference is that the United States currently has a 1% Federal Funds rate and 5% inflation, the approximate opposite of Japan in the early years of its slump. With M2 money supply (the one the Fed will divulge) up at an annual rate of 18.3% since the beginning of September it seems likely that inflation will accelerate – as it did in the recessions of 1973-74 and 1979-80. · Rising real rates of return. The yields on Treasury Inflation Protected Securities have already risen from just over 1% to nearly 3% since the beginning of 2008. Given the excess of bonds coming to the market, it makes sense that real yields should rise. That in itself suggests that conventional Treasury bonds are hopelessly overvalued – with the 10-year TIPS yielding 2.82% and the 10 year Treasury 3.78% (yields as of November 02 are even lower), the implied rate of US inflation over the decade to 2018 is 0.96% per annum, for a total rise in prices by 2018 of less than 10%. If you think that’s likely, I can get you a deal on Brooklyn Bridge! Thus Treasury bond and other prime bond yields can be expected to rise sharply in 2009/2010/2011. This will cause losses to their holders. To the extent that such holders are foreign central banks, the United States probably doesn’t need to worry. Foreign central banks have been gentlemanly holders of US debt through periods such as 2002-08 when the dollar has depreciated; a rise in interest rates simply gives them another way of making a loss. Personally if I were the Chairman of the People’s Bank of China and Treasuries had lost me the kind of money they have in the last five years I’d probably declare war on the US, but fortunately central bankers are a phlegmatic and tolerant lot! Government typically follow the 'Turkey pattern'. They pretend to care for the people during the 1000 first days but the next day they are slaughtered. If they can't inflate away the debt, they call for a debt moratorium. 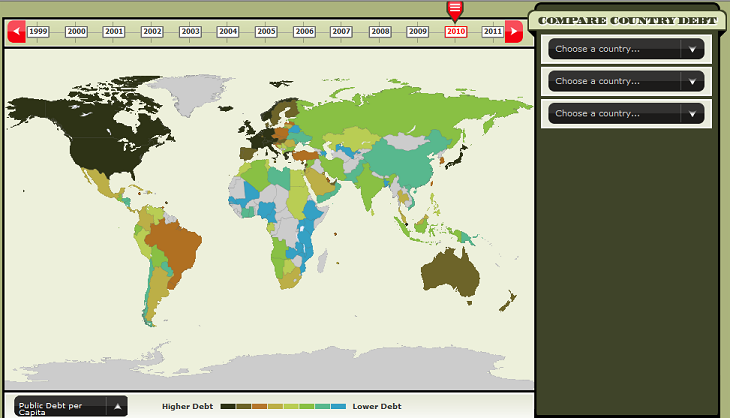 In Belgium 'the Unified debt-1945' is know of all financial people. Note how in from 1973 to 1980 interest rates rose to peak in 1981 and the price of GOLD rose and peaked at the same time. Or how this proof you have a 'Problem' if you are holding on to Bonds NOW!